This delicious recipe is healthy and incredibly quick to make, it only takes five minutes! Chia seeds are packed with goodness including omega-3 fatty acids, carbohydrates, protein, fiber, antioxidants and calcium. It’s been reported that Omega-3 fatty acids may help raise HDL cholesterol, which is the “good” cholesterol that can protect against heart attack and stroke. 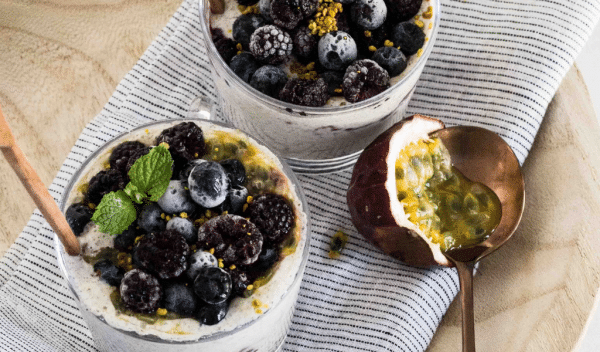 Enjoy our Chia Pudding for breakfast, a snack or dessert. Add all ingredients in a bowl or jar and stir well to combine. Refrigerate for at least four hours or overnight. Stir or whisk twice in the first hour of refrigeration to help it gel evenly. To serve, top with fresh fruit of your choice and enjoy!